As we have worked our way through many brands and models of coffee maker, we have tried the budget buys, the mid-range buys and of course the high end buys. The Moccamaster KBT definitely falls in the high end bracket. Does it really live up to the $300+ price tag? Read on to find out whether or not we thought it did. The Verdict – Is The Moccamaster KBT Worth the Price Tag? Stainless steel thermal carafe to retain heat and keep your brewed coffee warmer for longer. Pulse action brewing: The pulse action throughout the brewing process allows for a consistent extraction that will bring you the maximum flavour and aroma every time. The machine is simple to use. Simply add your desired level of coffee and desired amount of water and hit the on button. The coffee tastes amazing. It really does complete a full extraction with just the right temperature of water and you can taste the difference between the coffee this machine produces and the coffee other machines produce. It’s important to experiment with quantities of coffee and water to get your exact flavour requirements, because once you do, you won’t look back. A good starting point is six scoops of coffee to eight cups of water. Play around and find your flavour! This Technivorm machine is highly durable when properly maintained. Obviously we haven’t been able to test that, but a five year warranty by the manufacturer says they are confident it will last. That's the best advantage this product can boast by far. 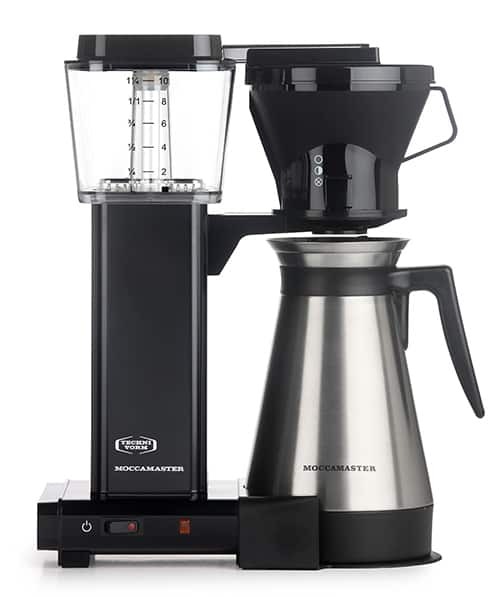 Technivorm's Moccamaster KBT is ideal for anyone who appreciates the finer things in life. The coffee tastes good and the machine will look nice on your counter. It’s a good choice for anyone who wants to make an investment in a machine that will last. This machine isn’t good for anyone who likes to be able to set the machine to brew their coffee for them waking up or coming in from work. There is no feature to pre-select an advance brew time. Honestly, no if you're not a hard-core coffee addict drinker. Yes, the coffee taste awesome once you find the perfect brewing strength to suit your taste. But (there’s always a but isn’t there) the machine does have some cheap looking plastic parts which you wouldn’t expect from a machine that’s over $300. We also found it quite strange that a machine of this standard and price doesn’t have pre-programmable settings. Naturally the best tasting coffee comes from beans that are freshly ground (it takes about thirty seconds for ground beans to start slowly losing their flavour) but that isn’t really the point. Coffee drinkers are well aware of the need for freshly ground beans, but sometimes, the convenience of having a pot of coffee ready when you are out weighs this. For the price, there should definitely be a choice. Considering machines in the thirty dollar range have programmable features, this is a major let down. Overall, this isn’t a bad machine. It is durable and it is pretty good valuable over the years. The coffee tastes good, better than the average machine. Also, the T﻿echnivorm Moccamaster KBT is selected as the best automatic drip coffee maker by America's Test Kitchen. However, it is greatly let down by the over reaching retail price and lack of features. If great tasting coffee is your only priority, then this machine could be for you, but if the convenience of pre-programmable settings is a necessity, then this is one to steer clear of. Also, if you're considering a one-time investment for a coffee maker, then this one is for you.